We are happy to share the release of additions and enhancements to Bing Custom Search. Bing Custom Search is an easy-to-use, ad-free search solution that enables users to build a search experience and query content on their specific site, or across a hand-picked set of websites or domains. To help users surface the results they want, Bing Custom Search provides a simple web interface where users can control ranking specifics and pin, or block, responses to suit their needs. The Bing Custom Search API gives you powerful ranking, a global-scale search index, and document processing with fast, simple setup. At Microsoft, we are committed to making AI accessible to everybody, and we are happy to see that a considerable number of websites around the world are powered by Bing Custom Search. We have been prioritizing new features and enhancements based on the feedback we have received since we announced the general availability of Bing Custom Search v1 in October 2017. In May 2018, we released Bing Custom Search v2 with important new features like custom image search, custom autosuggest, and a means for retrieving key insights regarding the usage of the custom search instance. Today, with Bing Custom Search v3, we are releasing even more. 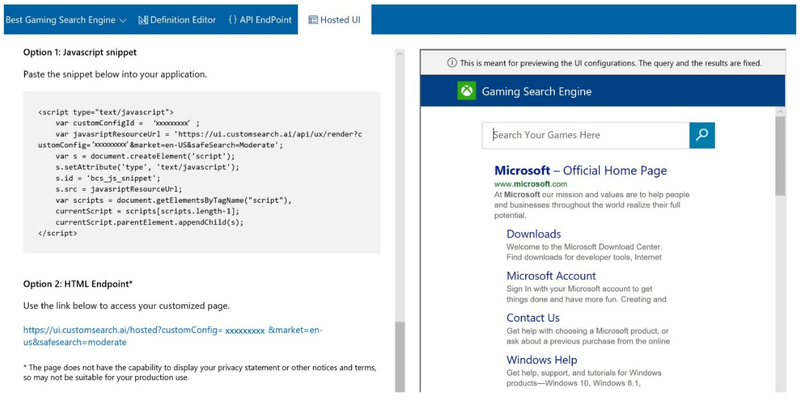 Get details about what’s new in Bing Custom Search v3 by reading the release announcement post on the Bing Developers Blog.